The Highland Trail 550 makes you see everything differently. You'll never be the same again. I don’t want to write a race report here. What I did when, what kit and equipment I used, where I resupplied, what my race strategy was. If you want a linear narrative on the race, read Joining the Dots written in 2016. This time I want to share with you some of the moments on this ride that blew me away and have caused me to think differently forever. I hope it will resonate with you whether you ride bikes or not because it’s from the heart and, after all, we all have one of those. 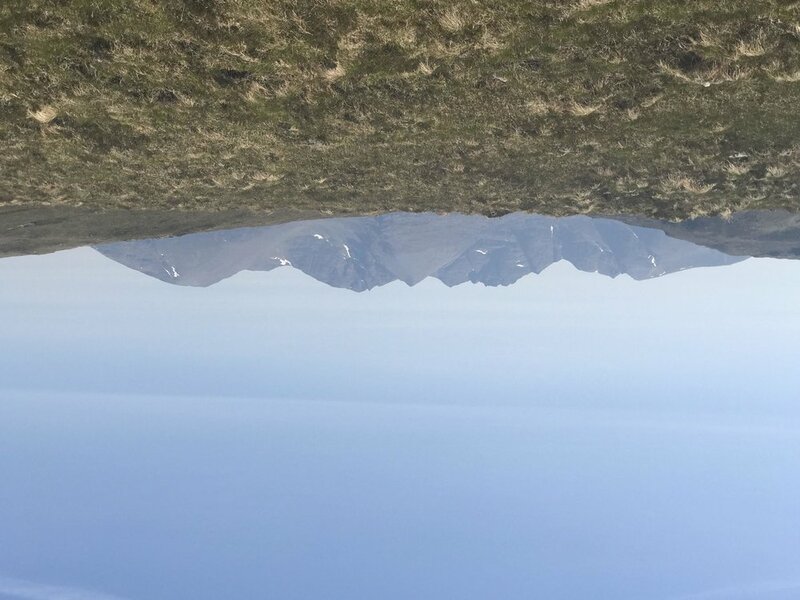 Whilst riding I tried to remember these moments as headings and when I returned to Tyndrum, I jotted them down in the hope that when I came to write this the feelings I’d had while out on the trail would return to me. I hope I make sense. “So hot. Head pounding. Stomach churning. It’s 2pm. I’m at the front of this race going over Ben Alder well up on last years time. At Culra Bothy I glance at the bridge we’ve always crossed in years past but my Garmin shows I go straight on. Something doesn’t feel right but I push it away. The heat must be affecting my judgment. I stay on the purple line. After four kilometres the track reaches the head of the glen and turns north, but the line on my Garmin continues to insist I go straight on. I stop and scroll out. The screen froze ages ago and I’ve been following the wrong trail. I turn around without pause to retrace my steps, giving up my hard-won lead to Huw Oliver, and explaining as I pass him that I’ve gone wrong. I won’t see him again for 24 hours. For the rest of the day I battle demons in my tired brain. It’s going to take me ages to claw back that time. I’ve just effectively given all my adversaries an hour’s advantage. Where I went wrong on the first day. That was an extra 8 km I could have happily done without. "I’m stressing out and going too fast to try and make up the time. I slow down and take a breath. Lee. What are you practising right now?" A friend once asked me this question and it’s so helpful. We get good at what we practise, so when I catch myself practising stress or anger, a gentle reminder that in doing so I’ll get good at being angry or stressed usually shifts my mindset pretty quickly. For some people the Highland Trail 550 is a big, self-supported mountain bike race in the Scottish Highlands. For me, it’s meditation in motion. My life is very busy. I run a not-for-profit organisation, make radio programmes, facilitate bikepacking expeditions for schools, manage a small team of other endurance athletes, give talks, write articles and go on my own bike adventures whilst always trying (though often failing) to invest in the important relationships in my life. Finding balance is hard but the only way I can do so is by hitting stop occasionally. I know it sounds ridiculous but the all-consuming challenge that is racing self-supported through the Scottish Highlands is me hitting stop. I’ve tried for years to sit still and meditate. I can’t. I’m like the excited kid at the back of the class, desperately eager to learn and grow. I understand those kids. We need motion to think and to find calm. It takes special energy and extra compassion to deal with us but we’re worth it. We have some great ideas and lots of energy to implement them. Having worked with these kids myself for years, I agree that it’s much easier just to squash them back into their seats and dampen their disruptive spark. But easy is boring. I’m fortunate. I had enough warm and generous adults with a spark of their own to ensure mine was never fully extinguished. These days, set me free on something like the Highland Trail 550 and that spark erupts into a full-on flaming ball of fire! Of course children need boundaries, but clipping a child’s wings has serious implications for them as adults. I’m an adult who survived the wing-clipping and on the start line of the Highland Trail, I find I’m surrounded by my people. My people. Tyndrum's Real Food Cafe the day after. "I wake up under a cold damp fog somewhere below the Orin reservoir. I tried to get to Contin last night but the concentration required to squint into the billowing fog at high speed was too trippy for my tired brain. I have slept well and am glad I stopped when I did. I ride for two hours before the sun takes control and transforms the still hanging fog into delicate wisps of ground cloud. A herd of deer stand alert on a grassy hillside as I ride close by. It looks like they are standing on clouds while all around them the dew on the grass dances and sparkles in the sleepy sun. I am close enough to be able to watch their ears twitch but they are hovering shadows to me behind the thin fog. I feel extraordinarily lucky to be here." 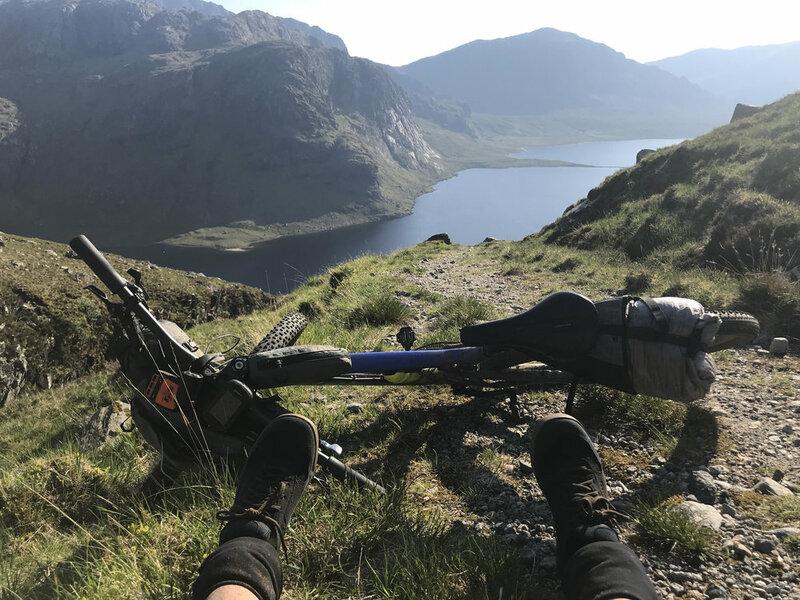 Riding 150 miles a day through Scotland’s most remote wilderness while snatching only smatterings of sleep will, ultimately, render you defenceless. It’s then that you start to let the vibrancy of the real world seep in. I should say seep back in. That vibrant, technicolour world is right there all the time, it’s just that it’s easy to let the colours dull when you’re busy and distracted all the time. Coastal singletrack near Lochinver. Suliven in the background. That’s what this ride does. It grinds you right down until you are childlike in your vulnerability and about as susceptible to joy. That’s when the good stuff happens. People like to suggest to me that what I do is a form of self harm, and sometimes I think they might be right. But I hope these insights help those people understand that the opposite is also true. That by stripping me bare and putting me out there physically and emotionally, an experience like the Highland Trail reinforces my values and offers me glimpses of the very best version of myself. The playful version of me that decides to put my head in a stream and in doing so sees all those different upside-down colours on the hillside where I might otherwise have seen only green. The patient, kind version of me that can listen, really listen, to the rambling petrol station attendant as she tells me her life story and so leaves my heart so swollen it propels me forwards long into the night. The curious version of me that, back behind the shade of that large boulder, took the time to give that insect the finest meal of its short life. These are the things I value and so when I’m being the best version of me, they are what I’ll choose to spend my precious time on. Going fast and hard on my bike doesn’t necessarily stand in contrast with that way of being. In fact, as I hope I’ve managed to explain, it helps me to access it. Why would I change that? To get a few minutes further ahead? Short-term, impatient Lee might. But a race like this is not won on seconds saved by rushing a conversation or killing a fly so you can better enjoy your food. It’s about harnessing your flow of natural energy, by minimising stress and controlling negative thoughts. If only it were that easy in our everyday lives. Pausing for effect above the Fisherfield Causeway because you just can't not. Time is our most valuable commodity and how we choose to spend it reflects our values. I like to fill my time. It's precious and I want to make the most of it but balancing quality and quantity is an ongoing struggle. We all have a choice of how we use our time (to a lesser or greater degree) but in a bike race this is brought into sharp focus. It’s easy to fall into the trap of believing that you must be going as fast as possible all the time, avoiding anything or anyone who might distract you from your self-imposed goal. I am as guilty as anyone of behaving this way in my daily life, but the folly of this becomes more apparent in these wild, special places. Here I am compelled to stop, breathe and be. After I have taken that moment, my balance on the bike is better, I’m more alert, I can manage discomfort more easily and I notice that my breath is less forced. No brainer. Two weeks after this race, a school pupil tells me what her mum says to her when she’s going too fast. “I’m finding it hard to tear myself away from the weirdly prehistoric beauty of this relatively unvisited hillside above Loch Maree. I’m vaguely aware that Alex must still be on the chase not far behind me but I have to stop and drink this place in. There’s a natural infinity pool on the edge of a wide grassy bowl about two thirds of the way along the Postmans’s Path. (So called because said postman used to negotiate the eight miles of nearly imperceptible singletrack that meanders through bluebells and ferns to deliver letters to Letterewe Lodge. I’ll bet he left his bike at home on those days though.) The heat has left the sun but I feel sticky with salt so I drop off the path to the pool and plonk myself fully clothed in its black, smooth waters. The cold water whips away two days of dirt, salt and dried blood, and when I eventually stand up I feel like a baptism of some sort might have just taken place. Over my right shoulder is an angry setting sun and over my left a shy pale moon. In the space between I stand dripping wet, feeling wildly alive and replaying my massive day of riding through my mind’s eye. I woke up below Suliven near Lochinver at 3.30am and I’ve ridden, pushed and carried through the bright light and harsh heat of an 18-hour day. The distance is difficult to comprehend." Sunset right. Moonrise left. Postman's Path panorama. 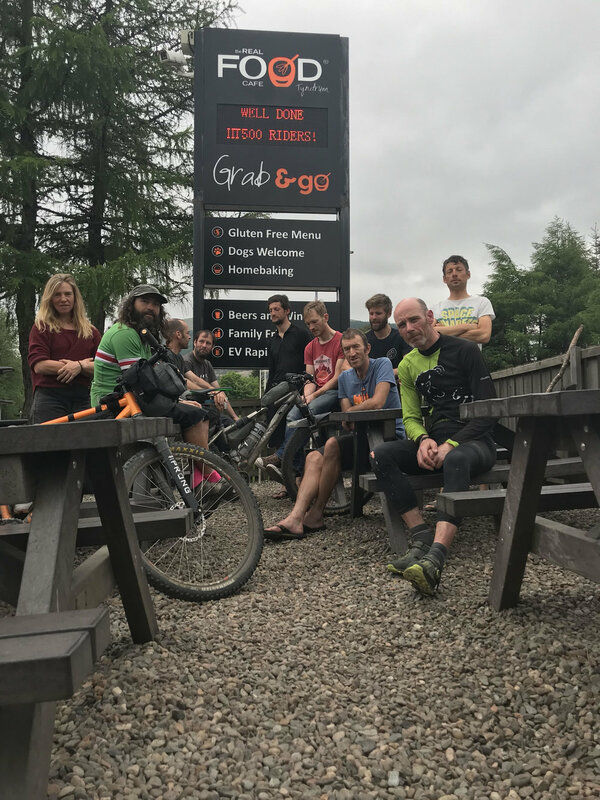 “It is dark by the time I hit the road at Kinlochewe so when my bearded friend Javi (who had been leading the race by a good couple of hours) pops out of the pub and starts yelling encouragement at me, I am baffled. It transpires he has lost the end cap from his thru axle somewhere on the Postman’s Path and tells me he is scratching from the race." Lee and Javi's baton change over in Kinlochewe. Photo courtesy of Karen. I tell him exactly where I’ve seen this vital piece of his bike over a pint of lemonade in the Kinlochewe Hotel. This exchange constitutes helping another rider but Javi's ride is more important than his race* so I tug his beard and beg him to go back and find the cap to his thru axle so that he might continue with his blistering ride regardless of his race result. I then get back on my bike and carry on up Glen Torridon into the night. I am, for now, in the lead and I ride round Loch Clair feeling the strongest I’ve felt throughout the race so far." An interesting thing happened next. I’m a risk taker. I can be pretty impetuous and spontaneous and I don’t like doing what is expected of me. That night I was feeling particularly lively and strong (I’d just seen two frolicking unicorns for heavens sake!) so despite it being midnight with the most technical descent of the route up ahead, all bets were on that I’d keep riding. But I didn’t. I still don’t quite know why, but it had something to do with a niggling lack of confidence in myself. I rationalised that the next day I’d have to ride through the night to stand a chance of finishing in less than four days and I wasn’t sure I could do that without first sleeping tonight. So I went against my instincts and stopped at the Tea Hut in Torridon. Inside was hot as hell and full of midges and other people but I squeezed in anyway and lay on the hard floor for two hours feeling my rapid heart biffing off my ribs. At 2.10am I couldn’t bear it any longer. I got up and started riding again. “I’ve slowed to a crawl. My stomach went into a painful, hard cramp back in Fort Augustus nearly three hours ago and it’s all I can concentrate on as I sit bunched over my handlebars forcing my legs in circles. I’m trying to negotiate the smallest of gradients and manage my momentum over the uneven trail surface of the West Highland Way between Fort William and Kinlochleven, but the smallest stones are stopping me dead. I’ve still got a long way to go in the gathering darkness to reach the finish line. I can’t do this anymore. I search my mind for a solution. I remember the headphones I bundled into my electricals bag at the last minute as I frantically packed my bike three and a half days ago (or was it a lifetime?). I never usually listen to music on a big wild ride. I prefer my own thoughts and being receptive to the natural sounds around me. But tonight, for the first time, I find I don’t have the resilience to turn my thoughts back around to my own advantage. I need external help. Garage forecourt smashfest. We've all been there. Now, 20 miles further down the trail I look at my screen. I scroll up through my notifications and keep scrolling, and scrolling and scrolling. There are so many messages of support and encouragement that I feel my eyes fill with tears. I don’t read them. That they are there gives me all I need. I pull my focus together and hit a series of buttons to play the first album I can find. It’s perfect. Dougie McLean (who wrote Caledonia) produced his first album, Real Estate, in the 90’s. It’s all about land ownership in Scotland and the wild glory of the remote Scottish glens I am riding through right at this moment. I’m transported back to being a confused, tortured, but ultimately hopeful adolescent, on the cusp of emancipation and thinking about my connection to the land for the very first time. Solid Ground bellows in my ears. A full moon has risen enough to be peeking out behind the ridge of Mam na Gualainn and is casting a shadow behind me on the wide rough trail that is now tilted ever so slightly downhill all the way to Kinochleven. I stay out of the saddle and press hard on the pedals and pull on the bars. I must be travelling at 30 miles per hour, hitting jumps and drifting into corners so fast that the moon can’t keep up. As I travel south it dips and shifts behind the ridge as though someone is chasing me with a spotlight. That was the most remarkable psychological turnaround I’ve ever experienced. I’ve battled on alone through suffering and hardship a lot in my life, determined to keep my vulnerability hidden and get myself out of trouble, but in that moment I’d reached out to my people past and present and they had responded: my friends and family, my long dead ancestors and the wild place I moved through. I had shown them weakness and no one was repulsed by it; in fact they had rallied and before I knew it I was a roaring lion again. I’ll not pretend that all the remaining miles that night were easy. Things got hard again over the Devil’s Staircase, so much so that I had to pull my sleeping bag out at the bottom and pass out right there on the trail for an hour. When I woke up it was 3am and my ambivalent stomach was growling and cramping at the same time. I knew I had to eat something if I was going to get back to Tyndrum and I was torn over whether to tough it out and push through or take it easier and try to look after myself. People ask how I keep my body functioning under these extremes of physical duress and over time I’ve come to the conclusion that treating my body like a small child who I care about very much works well. My five-year-old nephew never knows when he’s hungry. I’m quite sure that the discomfort he feels, which usually manifests in shoe throwing or foot stamping, makes the prospect of eating anything unappealing in the extreme, but I love him and I know him, and so I gently but firmly insist he takes on food. My body needed about 8,000 calories in a 24-hour period to keep moving forward on the Highland Trail but the thought of food made me feel physically ill, especially towards the end of the ride. There was a lot of trust involved in swallowing another grim flapjack when my child-like brain was screaming at me that I was going to be sick and that I wanted to be left alone to throw my shoes. But it always worked and I would feel instantly better and a little embarrassed by my naive, belligerent five-year-old self of moments before. I still catch myself in my everyday life yelling “Oh for f@*&k sake Lee, COME ON!” In those moments, I’m as frustrated with myself as I am with Moss when he won’t leave his Lego set and get in the car – but I would never shout at him like that. (“What are practising today, Lee?”) I’ll use humour, bribes, patience and compromise to get what I want. Why do we think that by shouting obscenities at our own tired, hungry five-year-old selves we’ll get a good result? On that last night, my five-year-old self was freaking out. She needed more than a handful of Jelly Babies. She needed a full-on swaddling cuddle followed by a warm bath. And this is when it all counts. I sat a moment longer at the foot of the Buchaille Etive Mor and talked her down. I promised her sleep and food and warmth in just a few shorts hours’ time. I promised that, if she could only trust me enough to meet me halfway, I’d take care of her when the sun came up. She put her wee hand in mine and reluctantly we got back on the bike. At around 6am that morning we rolled down the hill to Tyndrum and the waiting camera lens and understated care of James Robertson and Ian Fitz. It was over. I felt relief, fatigue, pride and grief all jumbled confusingly in my slow-moving brain. Fitz handed me a beer. I was vaguely aware of how badly I must smell. James took my photograph behind a screen of midges. Slowly it began dawning on me what I’d just achieved and my relief and pride swelled to obscure the grief I was simultaneously experiencing at having to say goodbye to the version of myself I love the most. I closed my eyes and hoped I might be able to capture a tiny part of her and weave her through my everyday life now that this ride was over. I knew it would be hard but easy is boring. Weeks have now passed and my life has returned to its busy norm. The results are up on the Highland Trail website. Alex stormed to the end on minimal sleep to take the win. I finished in second place overall in three days, 20 hours and 53 minutes, becoming one of only six riders to complete the route in under four days. The remarkable Javi on his singlespeed hardtail held together with cable ties and Sugru finished third in under four days too. Today my hands and feet have nearly recovered all sensation and I’m surprised at how much of this contented state of mind I’ve managed to retain this time around. I shouldn’t be surprised. The more we practise the better we get. What will you practise today?